I’ve attempted old fashioned fudge before. Multiple times, in fact. Most recently last weekend when I had a brilliant idea for a valentine’s day dessert. Unfortunately… it didn’t turn out so well. Everything seemed like it was going fine and I was beating the cooled fudge until it “lost its glossy sheen” according to the recipe. I put my spoon down for ONE second to grab my camera and… what was smooth and fluid seconds before had solidified into a sandstone-like mass. “Pour” it into the prepared pan? Yeah right. How about scrape and plunk. The mass was hard and crumbly, disintegrating into crystalline crumbles when you touched it. 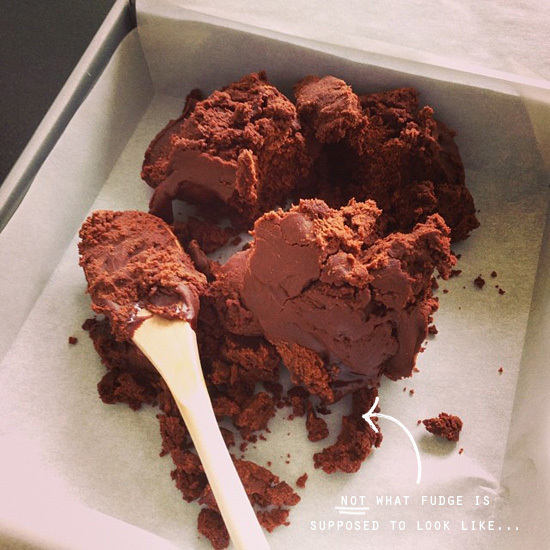 There is a reason that “fudge” has become a makeshift swear word. Even before this last disaster, I’d say I’ve made enough failed fudge to feed an elementary school. I attempted to develop a brown sugar fudge recipe for the first book. Every batch I made was either goopy and soft, or hard as a rock (never sandy though, that’s a new one to me). I think I went through 6 or 7 iterations of that recipe before I finally threw in the towel and grabbed a bag of powdered sugar for what I call “cheater” fudge. Damn good, of course, but it’s not the “real thing”. Indeed, I might be crazy for putting forth such a challenge, I might hate myself in a few weeks (and you might hate me too). But I’m determined to get this right. DETERMINED I tell you. 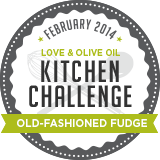 For this challenge, you must make old fashioned fudge. The kind they sell at the quaint little country stores in the Tennessee hills. Meaning get out your candy thermometer and boil some sugar. If I see a jar of marshmallow fluff or a bag of powdered sugar or a can of sweetened condensed milk… well… you’re fired. Boiling Sugar. One stray crystal and it all goes down the drain in one rock hard mass. If you can get it out of the pan, that is. Temperature. A precise candy thermometer is essential to this challenge. Calibrate it. And if you live above 1000 feet, be sure to adjust for elevation. Weather. Once again, sugar and humidity don’t mix. This is not a rainy day activity. Sanity. I may need counseling after this one. So might my husband, for that matter. Wish us luck? The batch above came from my trusty vintage candy-making book, Candy (The Good Cook Techniques & Recipes Series). This book proved a success for the taffy challenge, and I really appreciate the detailed instructions and step by step photos, but it failed nonetheless. I think I’m going to find a recipe with cocoa powder and corn syrup this time. 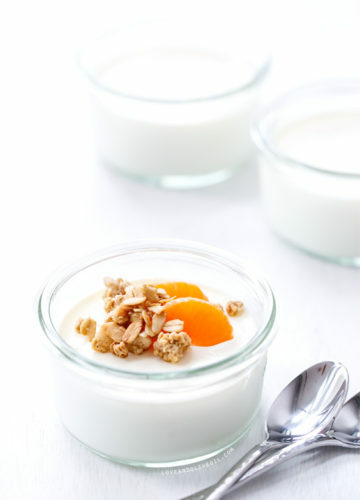 Like this recipe from Land ‘O Lakes. I’m not sure how fudge made with cocoa powder and chocolate differs, but seeing as how my chocolate batch failed so miserably I’m inclined to try to the cocoa version. Hershey’s has a nearly identical cocoa fudge recipe, minus the corn syrup and with milk instead of half and half. Honestly, the smidge of corn syrup is very comforting. Alton Brown’s fudge recipe seems far too simple to be real. 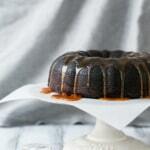 His uses unsweetened chocolate and a bit of corn syrup too. I’ll pass on the nuts. I’m really grasping here, eager for any all tips and tricks you may have from anyone who has successfully made fudge before. If you have even an inkling at what I did wrong and how to fix it, well, I’d love you forever. And if you have a tried-and-true recipe, please share! This is a group effort and I’m convinced if we all put our heads together we can figure this out. Attempt a batch of old-fashioned fudge by Friday, February 28th and send me a photo of your results (good or bad, the point here is to put forth your best effort). I’ll post about my experience the following week along with a roundup of everyone who was stupid brave enough to tackle this challenge with me. No fluff, no sweetened cond milk, and no powdered sugar, eh? Well that’s no fun :) kidding! I’ve actually never made the good old fashioned kind. Can’t wait to see what everyone comes up with! Love this challenge! I have a great recipe but it does use whole marshmallows and evaporated milk. Is that cheating? Otherwise, there is plenty of sugar, chocolate, butter and a thermometer involved. I’m ready! I’ve had the mess you had before and it took me years to do it just right. My issue was corrected with timing. If I boiled too little it wouldn’t harden. Too much and it wouldn’t spread. 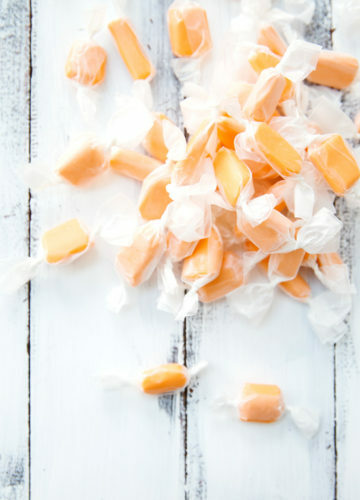 I have never made old fashioned fudge, but it is one of my favorite candy shop treats. I actually didn’t know it was that challenging, but after reading all this, I am thinking I was mistaken! However, who doesn’t like a good challenge. Especially when it ends with fudge. Well at least I hope it does! Love this challenge! What a fun challenge! Look forward to trying this! I’ m a huge fan of the sweetened condensed version, but I’m willing to give old fashioned fudge a try! I’m in! Great activity for February. Hopefully can become a Valentine’s gift if I can get it to work. i have a vintage recipe which uses evaporated milk – is that allowed? My mother uses the Hershey’s recipe, and has for years. When the fudge is ready to pour, you really MUST pour it immediately. My family learned to stay out of the kitchen when she’s making fudge, as you do not want to be in her way when it’s time to pour it out. Also, in the final step, you only want to beat the fudge until it has just begun to lose its sheen, not until it’s all thoroughly dull in finish. Ahem, fudge has been my nemesis for years, I can’t even remember the last time I attempted it, but I feel inspired to try again. Fingers crossed! 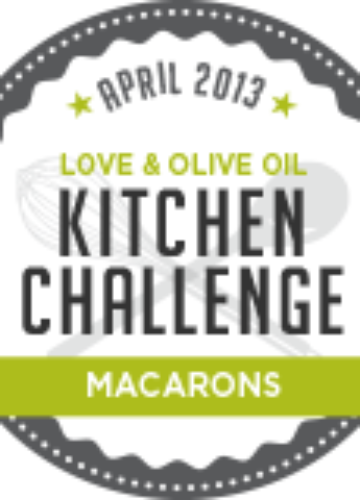 Alright, I just might attempt my first kitchen challenge! I have a cheater fudge that I love, but you just can’t beat the old-fashioned stuff. We’ll see how it goes! I love this challenge! Fudge is the first thing I learned how to make – my grandma taught me using the put a spoonful of the liquid into cold water and see if it forms a ball technique. That’s the only way I can make it now – I tried with a thermometer once and it turned out like yours above. I’m definitely going to make a batch for your challenge! Yum!!! Old-fashioned fudge is the only type allowed in my family :P Literally my mother and grandmother will not eat anything else. My younger sister used to request plates of fudge with candles in them for her birthday. Once the chocolate/sugar/milk mixture is up to soft ball temp, my mother takes it off the heat, and when it stops bubbling furiously she floats the butter and vanilla on top to let the butter melt. Then she walks away until the base of the pot is cool enough to rest the palm of your hand on. It’s SO HARD to wait…..but important. I made some fudge at christmas that was amazing, pretty shiny and definitely delicious! I just melted 500g dark chocolate in the microwave in a plastic bowl, and then added and warmed a 397g can of condensed milk. I then stirred in bounty pieces (mounds bars are similar in the US) and pressed into a pan- no sugar thermometre involved! I successfully made homemade fudge for the first time this Christmas using my grandmother’s recipe. I had attempted it 3 or 4 times before and had problems similar to yours – too hard and grainy. I found the key was to stir constantly until the mixture (sugar, milk, corn syrup, cocoa powder) comes to a boil then don’t stir again. I did at this point brush the sides of the pot with water to brush off any sugar that was on the side of the pot. I cooked it until it reached the soft ball stage and then removed from the heat and added butter and vanilla. I immediately stirred the mixture with the pot in a bowl of ice water until it started to lose its shine (I’m never sure if I’ve stirred enough) and then pour it into a buttered pan to set. Hope that helps! Yes, stirring/not stirring at the appropriate times seems to be more important than most recipes let on. When it was done cooking did you let it cool first before stirring? Many recipes say to cool to 130 degrees. No I did not let it cool before stirring. I set the hot pan in a bowl of ice water and began stirring. I have also seen most recipes say to let it cool before stirring, but when I tried that with this recipe it was too hard to stir by the time it cooled down and it turned into a lumpy mess. 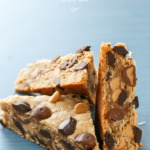 This recipe, like a lot of family recipes that are handed down, didn’t have a lot of directions with it so I had to figure it out using trial and error. The recipe did not mention letting it sit to cool before stirring so I decided to try the ice bath method. I’m not sure if I read a recipe somewhere that called for using the ice bath or if I made that up but either way it worked! 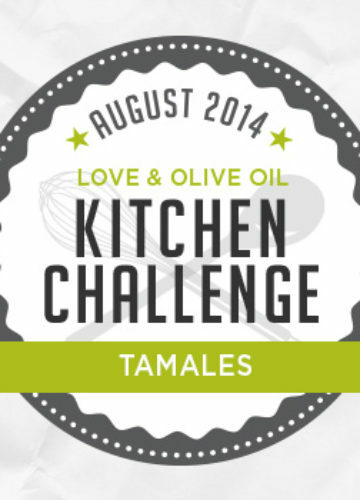 I am so looking forward to the contest winner’s recipes! I have tried for 20 years to make my grandmothers fudge recipe. It seizes just like yours no matter what. Now, we just eat it while it’s still hot, after the soft ball stage, no stirring. We call it spoon fudge. Thank god! I thought I was the only who knew what REAL fudge is. It is not supose to look like we sand! Its not something created in 10 minutes either! I will have to find my grandmother’s recipe in time! LOL Well, I got all excited because fudge is my thing. My dad has been teaching me to make fudge on the stove in a trusty old cast iron skillet for years BUT …. it’s always the kind with sugar, chocolate and marshmallow creme. Yep, we’re fudge cheaters but it comes out so silky smooth, I just can’t stand the thought of messing with perfection. Hold on, I’ve been cheating the entire time? For shame on me. Now I’m determined to do it the old-fashioned way. I’m off to do some research. I gave up on old fashioned fudge 35 years ago. Never could get it right, and since it was not common in our family (no one else made it) I had no one to hit up on for help. So I will wait with as much patience as I can muster. I would love to be the only family member who can make old fashioned fudge! I get fudge purists, I do. But my choice of recipe (MSL Kids) would have butter and marshmallows. I’ve never met an old-fashioned fudge that didn’t scrape my mouth, and I’ve given up trying. Good luck to those taking up the challenge though! Can’t wait to read about the results. Old-Fashioned Fudge Kitchen Challenge attempt number one: fail! My fudge was on the stove bubbling away when I decided to pull my candy thermometer out of the drawer to find it broken. I decided to wing it and use the soft ball in cold water method. Not as easy as it sounds. My fudge was pourable, but it hardened into a gritty brick. The flavor was there, but it wasn’t creamy and smooth. Attempt number two coming up as soon as I purchase a new thermometer. Ugh. Sorry to hear that. :( I have a feeling this one will be causing a lot of frustration across the board. I have this thermometer: http://amzn.to/1e5KP1m and really love it. Perfect for meat AND candy and it has an alarm so you can set your target temperature and not have to babysit the entire time. I can see this challenge causing a bit of frustration, but that’s what I love about a good challenge. It rips you out of your comfort zone and forces you to go down an unfamiliar path. I refuse to let the fudge win. Thanks for the info. about the thermometer. I’m on it! Don’t know if anyone’s said it yet but: NO WOODEN SPOONS EVER!!! One little bit of residual moisture or oil (which loves to stay on a wooden spoon) will ruin fudge or any other chocolate melting operation. I learned it a long time ago, didn’t believe my mother & my aunt when they told me and after too many chocolate batches thrown out… I believe them now! Karen, a wooden spoon is the only utensil my Dad, or I, have ever used when making fudge. I haven’t made a batch in years but I am getting ready to make some today. I will probably use a wooden spoon but if it doesn’t turn out, I will make a note and use a different utensil for the next batch. This is why these challenges are so much fun. There is so much to learn and experience. My dad’s mom used to make the most delicious peanut butter fudge. My dad has since taken on the task and it truly is an ordeal. We’ve found, that, depending on the weather, it can take anywhere from 45 minutes to 3 hours for a batch. And it does set alarmingly quick, that much at least we’ve noticed. I actually attempted to make a batch when I studied abroad in India to give to my host family, but it never correctly set. I imagine it had something to do with the humidity and the different ingredients, and the fact that my host mom didn’t believe how much sugar I needed. Good luck! The recipe we use is similar to Hershey’s and no matter how many times you make, it never turns out the same. :) Looking forward to joining the challenge. I have been making my grammy’s fudge for years (toffee, too). Not sure if this is considered “old-fashioned” or not; can someone tell me? Butter, sugar, evaporated milk. Boiled to soft ball stage, stirring constantly on a non-rainy non-foggy day. Take it off heat, stir in chocolate chips, marshmallows, and vanilla. Pour into pan and let set. I’ve never had it result in a grainy texture; it’s very smooth.